Finding Stockhausen's name in the Naxos catalogue is a welcome surprise. In the last decades of his life, the composer revoked all the copyright agreements he had hitherto organised with publishers and record labels, and had taken to releasing recordings and scores exclusively through his in-house Verlag. Presumably his wives have now taken a more media-savvy approach to his legacy and have begun loosening the estate's grip on his long list of game changing works. Naxos have been making significant inroads into the avant-garde repertoire in recent years, so perhaps it shouldn't be such a surprise that they are amongst the first to exploit this new opportunity. Mantra was something of a turning point for Stockhausen. It was written in 1970 after a number of works in which text scores and conceptual, indeterminate elements predominated. But from Mantra onwards, he returned to actually putting notes on paper. It is also the first work to employ a 'formula', a small musical cell which determines the overall structure of the entire work. In the case of Mantra, the formula is a 13-note series, clearly articulated at the start of the work, and then used as both motif and structural determinant. The work is for two pianos and electronics. The sound of the pianos is subject to almost continuous electronic manipulation, mainly through ring modulation, and according to the sleeve of this recording, that makes the piece effectively a trio, with the electronics designer/manipulator having a status equivalent to that of the pianists. I'm not so sure about that, but I can report that the electronic element in this recording is executed to a very high standard. 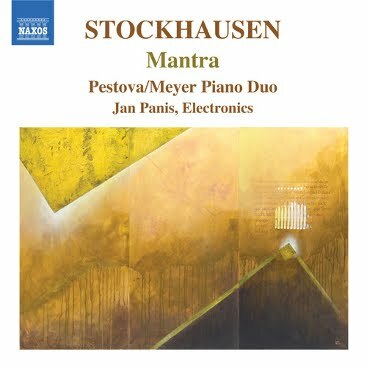 Jan Panis was a close collaborator with Stockhausen, and this recording makes a big thing out of the fact that it is the first to render the sound manipulation in digital rather than analogue terms. Again, I'm sceptical about how much of an achievement that actually is, ring modulation is, after all, a fairly easily analogue effect to emulate by digital means. Another effect is achieved by one of the pianists turning the dial on a short wave radio so that the interference patterns play out over the sound of the piano. Was this achieved digitally here? The liner doesn't say, but the effect sounds pretty old-school, whatever the technology behind it. The recording balance is excellent. We have the two pianos clearly separated in the stereo array, and all the electronic effects and manipulations are clearly audible, forming the ideal timbral bridge between the sound of the piano upper register and the various percussion instruments that the two pianists also play from time to time. Pianists Xenia Pestova and Pascal Meyer really get into the spirit of the work. There is a complex serial dimension to the rhythms here, but more importantly, there is a wry sense of humour that underpins much of the music. The performance is at its most successful in the quieter passages, where the two pianists have a wonderful sense of poise, not rushing any of the effects or rhythms, but letting each of the motivic devices play out as a response to its situation, to the utterances of the other piano, and of course to the electronic manipulations. There is sometimes a slight lack of urgency in the louder and faster passages, although that often feels as much a fault of the music as of the performance. Stockhausen relies heavily on sudden crescendos and accels to create climaxes, not a very subtle effect and certainly not one that these players have any intention of trying to excuse or sophisticate. That apart, this is a great recording. Jan Panis appears to be very proud that his digital version of the electronics will ensure the potential for future performances in years to come. In the same spirit, it is great to see younger performers taking up Stockhausen's cause. The last years of the composer's career didn't really do much to ensure continued interest in his earlier music, but its significance is undeniable, and its musical value is beyond question. Here's hoping that this will be the first of a long series of Stockhausen releases from Naxos. Actually, in addition to one of the pianists turning the dial that controls short-wave volume, BOTH are constantly turning dials to control the modulating frequencies.